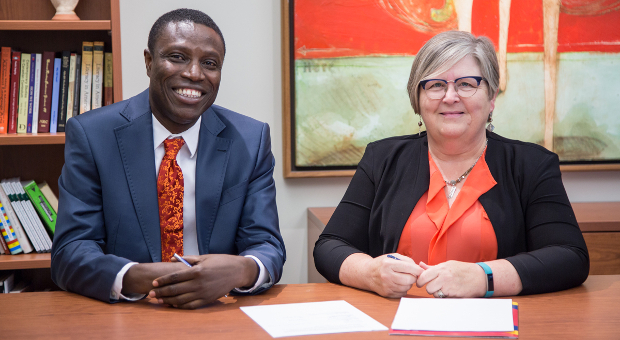 The Faculty of Education at Queen’s University formalizes its partnership with 1 Million Teachers by signing a partnership agreement in September. 1 Million Teachers (1MT) is a startup created by Hakeem Subair, a graduate of the Master of Innovation and Entrepreneurship program at the Smith School of Business. 1MT aims to attract new teachers to the profession in Sub-Saharan Africa by training new and practicing teachers and motivating them to improve their performance through a comprehensive reward based development program that combines high quality online and classroom-based training with mentorship on a scale never attempted before. The online component of 1MT incorporates gamification best practices that engage participants and motivates them to keep learning. 1MT leverages machine learning and artificial intelligence to create bespoke training for teachers on a large scale. In July 2018, Dr. Peter Chin, Associate Dean of Undergraduate Studies, travelled with Hakeem to Nigeria to support 1MT’s mission of supporting education for women and girls. The mission was endorsed by His Highness Muhammad Sanusi II, CON, Emir of Kano. Dr. Chin describes the mutual benefits to teacher candidates at the Faculty and teachers in Nigeria. “The best way to teach social justice is to model it in our own practice. 1MT is our international commitment to social justice and creates a community of professional practice that will improve teaching and learning in Nigeria." Written by Nadya Allen and Rebecca Carnevale. Photo by Nadya Allen. Story as it originally appeared on the Faculty of Education website.